Although an unembellished home-made croissant is a truly wonderful thing to eat, savoury variations excite me hugely! This version, using cheese, ham and mustard as the key flavours, is my favourite savoury one by far : simple flavours that make these light, crisp pastries ridiculously addictive to eat, whether served cold or warm. Black Forest ham is an excellent ham to use here; its strong, smoky flavour adds a real wallop to the overall flavour, but any good quality ham works very well. I tend to use a cheese such as Gruyère or Comté that has a nice nutty flavour. Only a little cheese is needed for little more than a sprinkling over the dough, rather than a thick coating of cheese. I sometimes like to dot just a little caramelised onion chutney over the filling in place of the mustard, although I have, on occasion, used both! The onion gives a lovely sweet note to the pastries, contrasting brilliantly with the rich saltiness of the ham. While these can be made very well with puff or rough-puff pastry (if buying the pastry it has to be the all-butter variety! 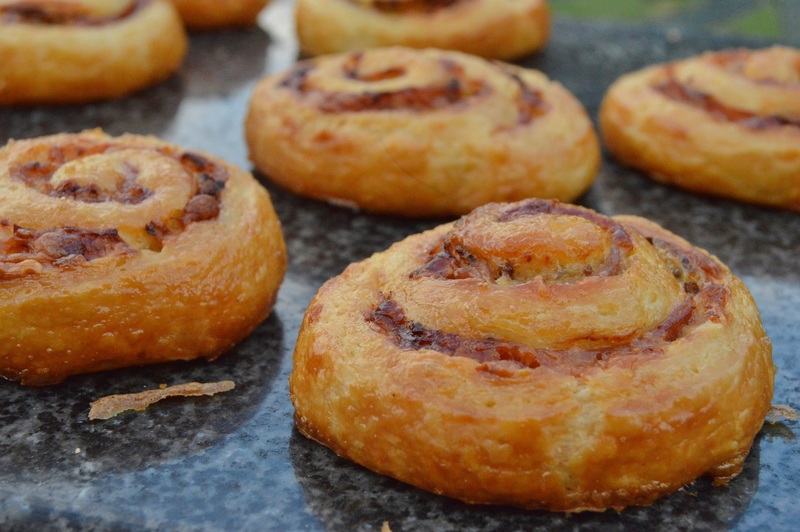 ), using a croissant dough makes a huge difference, giving these pastries more body, but with a wonderful lightness. I tend to use a short-cut croissant dough here: it is quite easy to make and is much quicker than making a traditional croissant dough, yet it gives excellent results. You could use the commercial croissant dough that comes in a tube, but they only give a pale imitation of what you could be eating! I have used mustard powder in the pastry dough itself, which acts as a spice in its own right, adding enough of a mustard note without being over-powering. 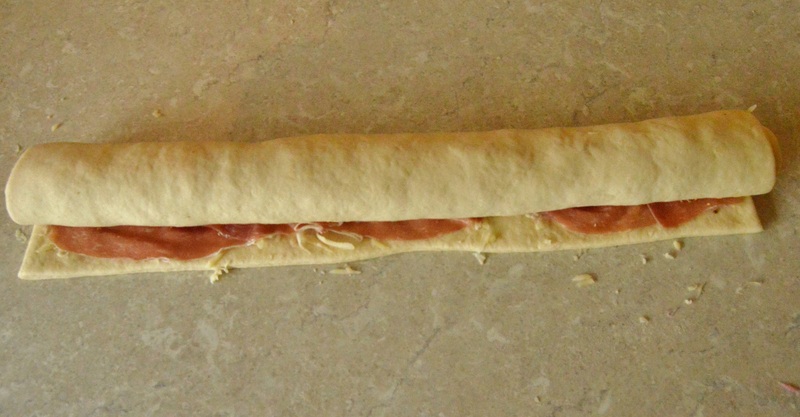 (1) Roll out and trim the ready-made laminated dough to a rectangle about 40cm by 30cm – or simply roll out to a longish rectangle until the dough is fairly thin (there is no need for exactness here!). 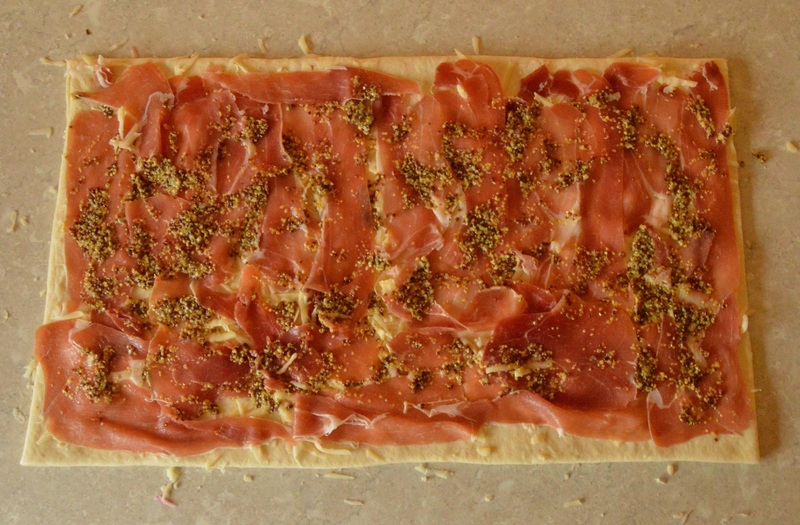 (2) Spread over the mustard, sprinkle over the cheese and place the ham on top, patting down gently. (3) With the long edge in front of you roll up fairly tightly and gently squeeze the seam to seal it to the dough (this is so the pastries do not unfurl as they prove and as they bake). You will have, in effect, a very long swiss roll-type affair! Ensure the seal is underneath and coat liberally with the beaten egg. You can chill or even freeze it at this stage if you want. NB: you can instead roll up widthways, giving larger whirls with more of a spiral. At the other end of the scale, if making canapés, cut the rectangle in half horizontally and then vertically to give 4 small rectangles before rolling each up. 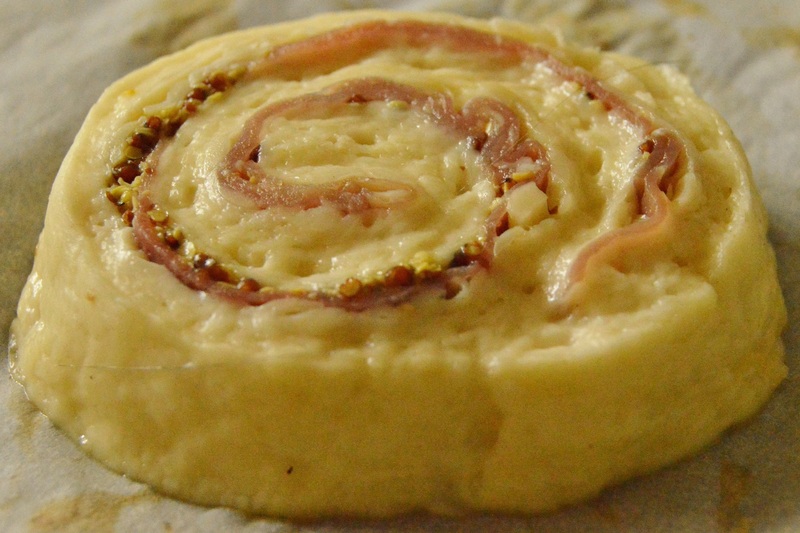 (4) With a very sharp knife, cut out thin discs about 2cm wide and place on baking sheets lined with greaseproof paper with the clearest cut side face upwards, so you can see a small spiral of ingredients – as in the picture below. (5) Cover with clingfilm or pop inside a large plastic bag/bin liner and prove for a couple of hours or so at room temperature until they have almost doubled in size and look puffy. (6) Glaze the sides and the surface carefully with more beaten egg and bake in an oven pre-heated to 180°C (fan) for about 15 minutes until golden brown and flaky. Cool on a wire rack.